Fashion For Change is an event in Second Life running from April 11th through April 25th. This event benefits a wonderful organization called Womankind Worldwide. Womankind Worldwide is a UK based, international Women’s Rights charity working to help women transform their lives and communities in Africa, Asia and Latin America. They celebrated their 25th Anniversary last year (2014). The charity’s motto is “Equal, Respected, Proud,” and its vision is of a world where being a woman does not limit choices, opportunities or rights, no matter where she lives. Womankind delivers the essential support – funding, expertise, contacts and publicity that these local grass roots women’s organizations need to amplify their voice, increase their impact and bring about greater change in their communities. Womankind’s approach is not to impose a ‘top down’ solution but to help and empower the women’s groups it works with to achieve their own solutions and change. Womankind Worldwide also works in wider arenas, to lobby for change , working to influence the powers and practices of governments and non-governmental organizations. While not being a very large charity, over the 25 years of its existence it has supported directly and indirectly over 18 million women and their families. In 2013, for instance, it worked in 15 countries, directly supported almost 141,000 women, and helped improve the rights of over 6 million women. In 2013 as an example, it worked in Afghanistan, Bolivia, Ethiopia, Ghana, Kenya, Liberia, Malawi, Nepal, Peru, Sierra Leone, South Africa, Tanzania, Uganda, Zambia and Zimbabwe. What follows is just a tiny example of the schemes, large and small, that it has helped. Bolivia – WW helped 550 indigenous and peasant women leaders in 5 out of the country’s 9 regions to acquire the knowledge to challenge discrimination and they are now actively participating in local politics. Tanzania – WW worked with the Women’s Legal Aid Center in the Nyarugusu camp to support refugee paralegal units to take action on violence against women, and other human rights abuses, and they trained the wider community to recognize, promote and protect the rights of refugee women, children and men. Ethiopia – over five years, alongside another charity, WW worked with local communities to raise awareness of women’s rights, violence against women and harmful traditional practices. Just one result of this work was that 250,000 girls escaped genital mutilation. That is only a tiny sample, the list could go on for hours…. This is a charity where even small donations can make a significant difference, because the money is targeted to make maximum and lasting impact. Some examples are shown below. $20 US could train a police person in Peru in issues of sexual exploitation, violence and women’s rights to ensure that they better support trafficked women and women in prostitution. $60US could train a community paralegal in Ghana, to provide legal support to survivors of violence, helping them to obtain child custody, a divorce or to keep their home. $300US could train 25 Aymara women in Bolivia to educate other women in their communities on women’s rights, violence and leadership. Looking at the figures, you can see that there is a real chance that money raised in Second Life could make a real difference somewhere. 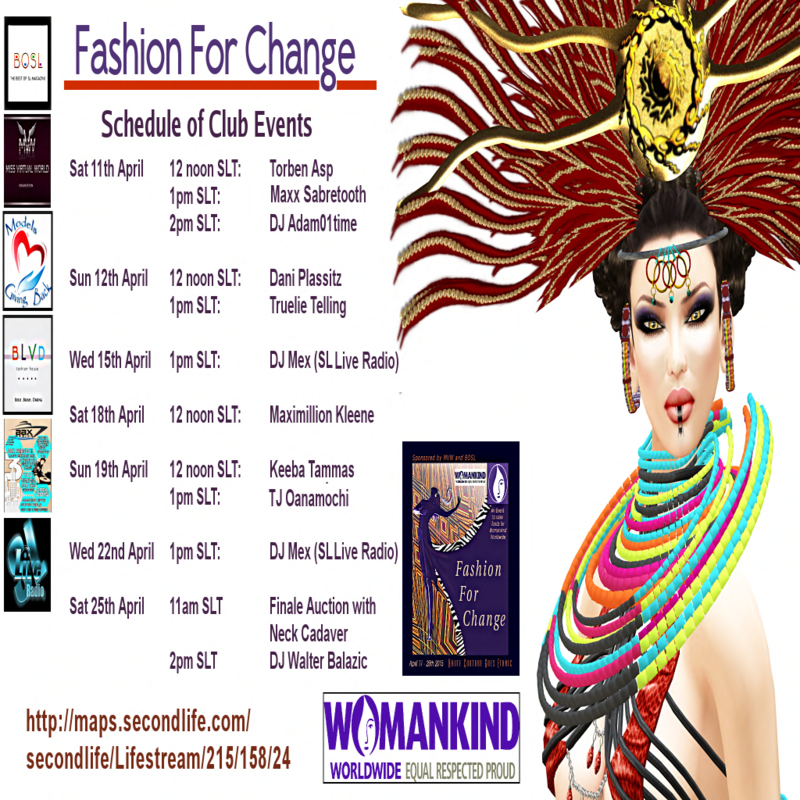 Womankind Worldwide’s weblink can be accessed by clicking this link: Womankind Worldwid. Posted in EVENTS. Tagged Fashion For Change, Second Life, Womankind Worldwide, ZoHa Islands.